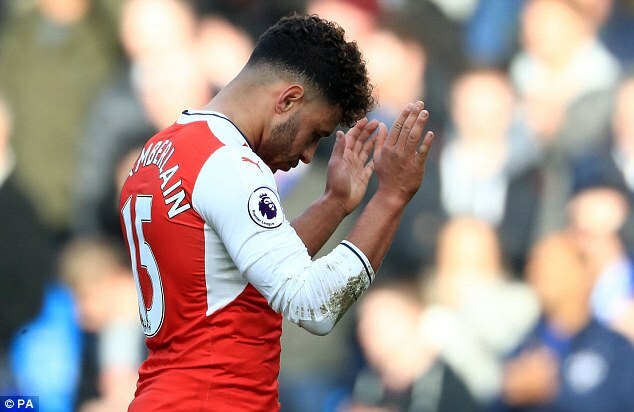 Arsenal’s errors of concentration were not confined to the pitch at Chelsea and Alex Oxlade-Chamberlain followed the 3-1 defeat by accidentally ‘liking’ a fan rant on social media. 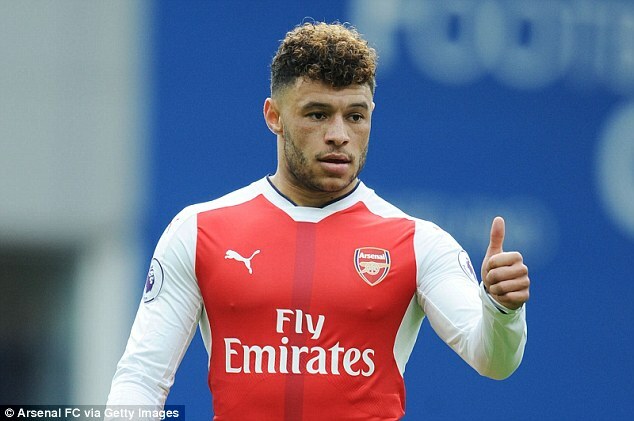 The Ox immediately realised his fat-fingered mistake and clarified his error on Twitter: ‘I didn’t mean to like that post earlier obviously… Didn’t even realise I had!’ He also called clubs officials to explain and apologise. He had inadvertently pressed the heart-shaped ‘like’ button on a post by Arsenal Fan TV, which read ‘Wenger needs to go’. 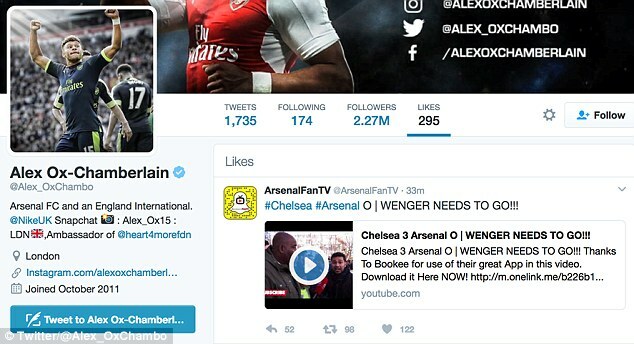 Some of his 2.2 million followers noticed his mistake and screen grabs were taken and re-posted before Oxlade-Chamberlain rectified his error and unliked the tweet. If only it were so simple to ‘unlose’ 3-1 at Stamford Bridge. Arsenal trail Chelsea by 12 points and some supporters made their feelings clear at Stamford Bridge. They were angered by manner of the defeat to their London rivals. Eden Hazard struck a stunning solo goal as Chelsea boosted their Premier League title hopes and left Arsenal’s in tatters. Arsenal may have complaints about Marcos Alonso’s opener, which came when he clattered Hector Bellerin. But the visitors could do nothing about the second in Chelsea’s 3-1 win at Stamford Bridge. Hazard picked the ball up in the centre circle, evaded Laurent Koscielny and brushed off Francis Coquelin before fooling Koscielny, again, and drilling in by Petr Cech. Cech gifted the ball to Cesc Fabregas, who casually lobbed the goalkeeper, for a third, as Chelsea ruthlessly punished Arsenal, who gained scant consolation with a late Olivier Giroud header.